Manufactured From The Highest Quality Materials To Ensure Corrosion Resistance Whilst Still Being Lightweight. French Knitting Is A Traditional Way To Teach Children The Basic Principles Of Knitting. Knitting Dolly. Complete Children's Knitting Kit Teach them to French Knit - Easily! Your Knitting Kit will include all the following All the wool isas pictured in a gorgeous selection. The storage box and wool may vary in design - but all beautiful prints! Classic French knitting kit. Great for children who love crafts. Make bracelets, purses & more! 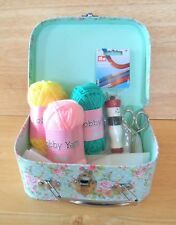 Kit contains knitting dolly, wooden needle, yarn & instruction booklet. Suitable for 8 Great activity for the Easter holidays! French skipping kit that includes 3m of skipping elastic and 8 page skipping song book. Complete with instruction leaflet, and 2 small amounts of wool. CHILDRENS CRAFT KIT CROCHET FRENCH KNITTING SEWING FUN & EASY PRETTY GIFT BOX!! For knitting needles size 2.5, 3, 3.5 (not included). This is a complete kit for a cardigan, hat and mittens for a baby aged 6 months. French Knitting Yarn Make Own Yarn Butterflies Kit Aged 8 4M. Condition is New. Dispatched with Royal Mail 2nd Class. Features specifically designed knitting reel that allows kids to make their own yarn butterflies. Includes: 1 French Knitting Tool; 1 Crochet; 5 Coloured Yarns; 6 Moving Eyes and detailed instructions. Makes 3 yarn butterflies. Contents: knitting dolly, wooden needle, 1 ball of yarn, a 10-page instruction booklet for French Knitting with suggested creations. French Knitting Kit. This is a great kit for kids who love crafts. Children’s French Knitting kit. Condition is Used. Knitting kit for a Lofty reversible cowl knitted in Brioche stitch in a simple repeated pattern that gives a stunning result. More information can be found on-line in various youtube videos. Also Brioche is easier to knit in the round than it is in the flat. Knitting Kit that contains tools and materials needed to start knitting. NEW BOXED: MAKE YOUR OWN FRENCH KNITTING CHICK KIT-. 2 x Weaving Wheels. All you Need is Enclosed (except glue). if on the rare occasion (we are human!). there is a problem. we always aim to put any problems right. Use the easy to follow instructions to crochet and bring to life a little owl or mouse. This set includes; assorted wool, needle, knitting loom wheel, crochet hook, eyes, felt shapes, stuffing and instructions. TINPLATE SUITCASE. Small tinplate suitcase with a wooden carry handle containing. set contains :- A french knitting knitting nancy. KNITTING SET. a knitting set for a young child. 2 x knitting needle sizes. Djeco French Knitting Red Elodie. Baby & Toddler Toys. Baby Clothes. Suitable for ages 7 - 12.